One of the main reasons I wanted to come with the Big K on his trip to China was the opportunity to see the Terracotta Army of Emperor Qin Shi Huang. The story of these life-sized clay sculptures have been frequently featured in magazine articles and TV documentaries. And what makes these statues remarkable is the sheer number of them. No, we're not talking of a handful nor a hundred but think thousands! Thousands upon thousands of warriors and horses, all created to accompany a single person in the afterlife. And where do you find this incredible army? It's in Xi'an, the ancient city in the Shaanxi province. Xi'an is one of the oldest cities in China and was once the eastern terminus for the Silk Road. It was also the capital city of 13 dynasties (there were 26 dynasties in all) where a total of 73 emperors once ruled. Now, how do I get from point A to point B? 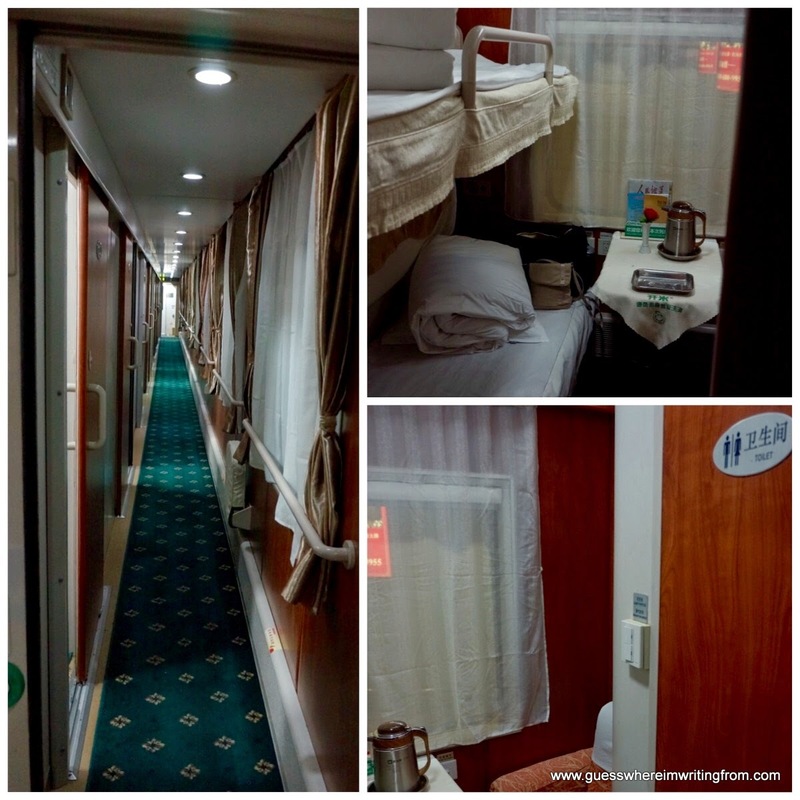 I had three options: a two-hour plane ride, a six-hour high speed train or a 12-hour overnight train ride. The plane fare was too expensive on my travel dates while the high speed train schedules meant a hotel stay in the city. Since I figured one whole day was enough time to see the Terracotta Army, probably squeeze in one or two more popular tourist sight/s, an overnight train would be perfect (arrive in the morning, do a whole day tour and return at night). Plus it came out the cheapest among the three options. It's going to be another train ride for me! Hmmm... I'm seeing a pattern here. It's turning out to be the year of train rides for me. You can check out my earlier train rides here and here. 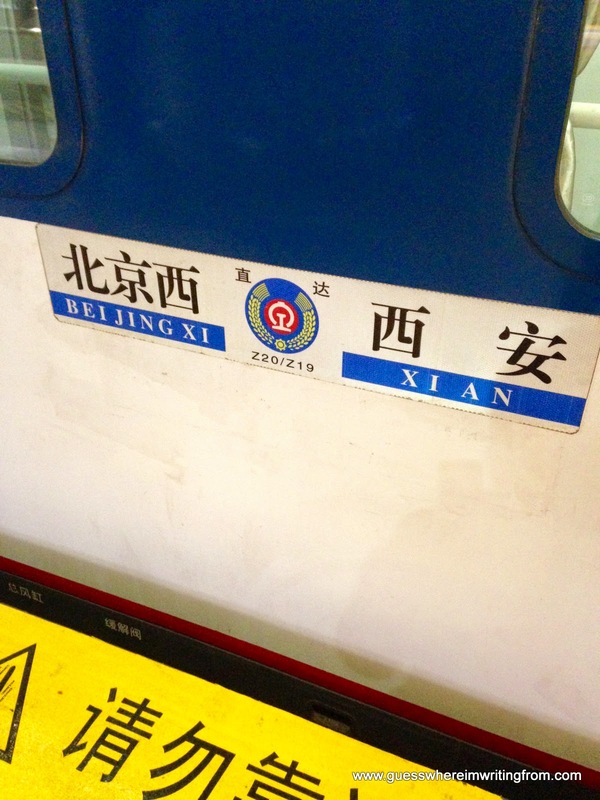 Beijing (Central) Railway, Beijing North, Beijing South, Beijing East and Beijing West. My train for Xi'an left from Beijing West Railway station. After deciding to take the train now comes the question on how and where to get my tickets. Well, one can do it the hard way: buy train tickets at the train station. Quite a challenge if you don't speak or understand Chinese (although the railway company has a website where one can purchase tickets online but then again it's only in Chinese). If you do decide to go this route, buy your tickets as early as you can (not hours but days before your travel dates) as trains get filled up fast. Train travel is very popular in China. indicates the train number, destination, departure time and the waiting room number. My train Z19 was assigned at waiting room number 4.
tea cup. I should have ordered the chrysanthemum tea, it came with refills. at the ticket check gate once the train is ready for boarding 20-25 minutes before departure. story coming back! But still it was a good train ride experience. I usually DIY my travels but for this trip I decided to hire my own tour guide as I found out that the Terracotta Army museum was another hour and half drive away from the city. And since I only had a short stay, I didn't want to waste my time figuring out how to get there. Oh and my no-speak-Chinese didn't help my cause either. This is it! The golden ticket! One of the greatest archaeological finds of the century, the Terracotta Army has been inscribed in UNESCO's World Heritage List in 1987. It is an active dig site as local archaeologists have been working here since its discovery in 1974 by local farmers digging for water wells. And one of the more interesting facts here is that archaeologists are still finding a lot of ancient objects. The whole site is actually a part of a huge necropolis that belongs to the first emperor of unified China, Qin Shi Huang (the same emperor responsible for the building of the Great Wall of China). Talk about a penchant for construction on a grand scale! The entrance to Pit no. 1, the largest of three pits and the first one to be discovered. What a sight to behold! It gave me goose bumps! Pit no. 1 contains the infantry soldiers. much like 3-D jigsaw puzzles. Here are some of the assembled soldiers on display to the public. A depiction of what Pit no. 2 would have looked like with the cavalry unearthed. Pit no. 3 is the command center. Cavalry man and his saddled war horse. After a hearty lunch and a free tea-tasting ceremony (I've always been a coffee person but the demo was pretty interesting), it was back to the city to see the Big Wild Goose Pagoda and the Muslim Quarter. scriptures) and figurines of Buddha were kept. It was built in 652 during the Tang Dynasty. the Silk Road network (June 2014). merchants settled. Most of the present residents here are descendants of those immigrants. The place is a veritable food and souvenir heaven! The Big K is surely missing this! welcome relief to enter the peaceful garden of the Great Mosque. The main prayer hall of the Great Mosque, built entirely in Chinese-style architecture. And it's a date with the Sandman. Good night! You can check our Facebook page for more photos.